"It makes me look so bad." For more cartoons by Mike Luckovitch, CLICK HERE. 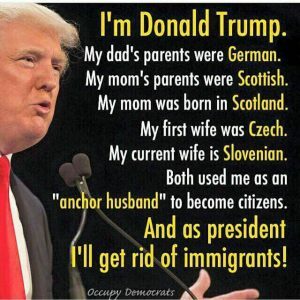 Transcripts obtained by the Washington Post show President Donald Trump's aggressive approach to foreign relations early in his presidency, as he spoke with the President of Mexico and Prime Minister of Australia about immigration issues. A week into his term, Trump was apparently concerned about his ability to deliver on his oft-repeated promises to build a wall on the United States' southern border, to "make Mexico pay for that wall," and to keep refugees out of the U.S. In a transcript released Thursday, he urged Mexican President Enrique Peña Nieto to stop telling the press that his country had no intention of funding a border wall. Trump had spent the 2016 presidential campaign promoting the wall as a way of keeping drug dealers, rapists, and other criminals from Mexico out of the country. The president addressed Peña Nieto as though he was an adversary, despite the United States' close relationship with Mexico—or a member of his communications team. He directed the Mexican president to help promote Trump's immigration agenda in his dealings with the press and said the wall was "the least important thing we are talking about, but politically this might be the most important." As Peña Nieto had been firm in his position that Mexico would not pay for a wall, Trump repeatedly told the Mexican leader, "You cannot say that to the press," and suggested, "We should both say, 'We will work it out.'" Peña Nieto replied that Trump's anti-immigration agenda "is an issue related to the dignity of Mexico and goes to the national pride of my country" and reiterated that he would not pay for a wall, but agreed to stop talking about the border wall entirely. Trump also argued with Malcolm Turnbull, the Prime Minister of Australia, with whom the U.S. had previously had a warm relationship. The two discussed a deal that had been reached by Australia, the United Nations, and the Obama administration, that the U.S. would take up to 2,000 refugees who were being held in Australian detention centers, provided they passed security screenings. Trump called the plan "a horrible deal, a disgusting deal that I would have never made," while Turnbull attempted to explain the nuances of the arrangement. Although Trump was under the impression that the refugees were in detention centers for committing crimes, Turnbull stressed that they were "economic refugees from Iran, Pakistan, and Afghanistan" and that they were detained to stop the business of people-smuggling. He also noted that Vice President Mike Pence had called the Australian foreign minister less than 24 hours prior to say the refugee deal would be continued. Still, Trump appealed to Turnbull to drop the deal, suggesting that accepting refugees after running an anti-immigration campaign would not sit well with his base. "That puts me in a bad position," he said. "It makes me look so bad and I have only been here a week." A White House official defended Trump's demeanor during the phone calls, saying, "In every conversation the president has with foreign leaders, he is direct and forceful in his determination to put America and Americans first." But political observers were alarmed by the transcripts.